Policymakers had to invest more in foster care and accept it was the preferred out-of-home care for children who are taken away from their biological parents, social worker and lecturer Daniella Zerafa urged this week. “Children need policy makers who invest in attracting more foster careers, not hesitating to declare foster care as the preferred out-of-home care setting,” Dr Zerafa told an international conference about children in out-of-home care. At the moment, around half – or 220 – of the children in out-of-home care are in foster care, while the rest are in residential care. Herself a foster parent, Dr Zerafa has looked into 15 family situations where a care order was issued, and another 15 families for whom social workers considered issuing a care order, but did not. According to her research, the first of its kind for Malta, children need early intervention and timely decisions. “A year in a child’s life is not the same as a year in an adult’s life,” she noted. Called Setting Sail from a Safe Port, the conference is being organised by the President’s Foundation for the Wellbeing of Society, International Foster Care Organisation, National Foster Care Association Malta, Foundation for Social Welfare Services and Eurochild. 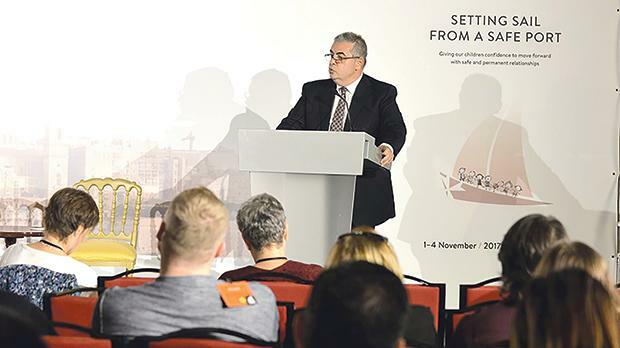 Speaking at the conference, Family Minister Michael Falzon said the government understood the sensitivity around issues that may arise in situations where children are placed in out-of-home care. He referred to President Marie-Louise Coleiro Preca’s call on Thursday to address shortcomings, reiterating the government’s commitment to strengthen all stakeholders so as to provide a positive life to these children. “We are here today with a common understanding that every person has a role in protecting children and promoting their well-being,” Mr Falzon said. Another participant, lawyer Daniela Azzopardi Bonanno, meanwhile, questioned the implications, and provided solutions, for mandatory reporting of child abuse by professionals. According to the Child Protection Act that became law last January but has not yet been enforced, pending a legal notice, professionals are obliged to report any child abuse they are aware of. Insisting that it was the state’s obligation to protect children, Dr Azzopardi Bonanno noted that mandatory reporting might lead to a flood of reports and unnecessary investigations as professionals might act on every suspicion they have for fear of reprisal. Mandatory reporting also risked breaking the trust the professionals had with their clients. Training on how and when to act and report abuse was therefore crucial, Dr Azzopardi Bonanno argued, also suggesting the setting up a multidisciplinary team that takes the child away from their birth home. The present lack of guidelines and need for training came out in interviews that Dr Azzopardi Bonanno held with professionals, however, she expressed alarm that this need was not brought out by her Vice Squad interviewee, despite being at the front line. The lawyer also insisted on the right of the child to be medically examined without parental consent when there is suspicion of abuse.